The Perseus Signal -- "What We Found Could Not Be Explained by Known Physics"
“I couldn't believe my eyes,” said Esra Bulbul of the Harvard Center for Astrophysics. “What we found, at first glance, could not be explained by known physics.” Together with a team of more than a half-dozen colleagues, Bulbul used Chandra to explore the Perseus Cluster, a swarm of galaxies approximately 250 million light years from Earth. 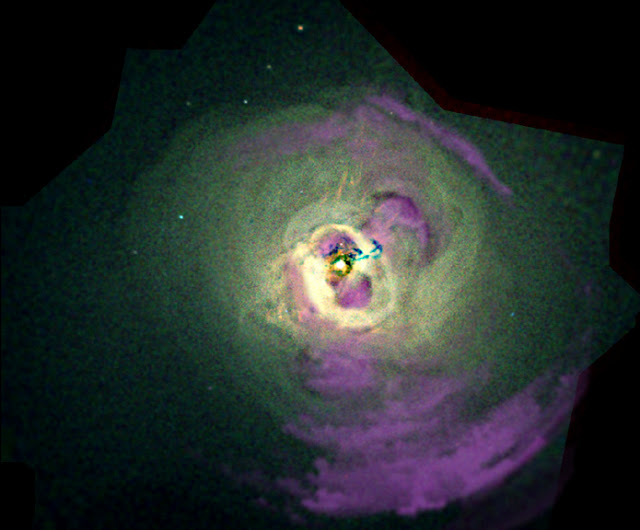 Imagine a cloud of gas in which each atom is a whole galaxy—that's a bit what the Perseus cluster is like. It is one of the most massive known objects in the Universe. The cluster itself is immersed in an enormous 'atmosphere' of superheated plasma—and it is there that the mystery resides. At first, Bulbul herself did not believe it. “It took a long time to convince myself that this line is neither a detector artifact, nor a known atomic line. I have done very careful checks. I have re-analyzed the data; split the data set into different sub groups; and checked the data from four other detectors on board two different observatories. None of these efforts made the line disappear.” Bulbul said. In short, it appeared to be real. The reality of the line was further confirmed when Bulbul's team found the same spectral signature in X-ray emissions from 73 other galaxy clusters. Those data were gathered by Europe's XMM-Newton, a completely independent X-ray telescope. Moreover, about a week after Bulbul team posted their paper online, a different group led by Alexey Boyarsky of Leiden University in the Netherlands reported evidence for the same spectral line in XMM-Newton observations of the Andromeda galaxy. They also confirmed the line in the outskirts of the Perseus cluster. The spectral line appears not to come from any known type of matter, which shifts suspicion to the unknown: dark matter. “After we submitted the paper, theoreticians came up with about 60 different dark matter types which could explain this line. Some particle physicists have jokingly called this particle a 'bulbulon',” she laughed. The menagerie of dark matter candidates that might produce this kind of line include axions, sterile neutrinos, and "moduli dark matter" that may result from the curling up of extra dimensions in string theory. Solving the mystery could require a whole new observatory. 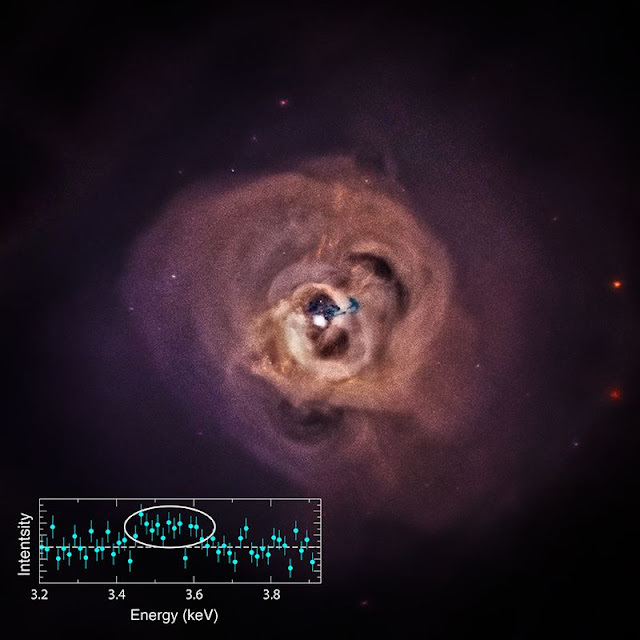 In 2015, the Japanese space agency launched an advanced X-ray telescope called "Astro-H."
It has a new type of X-ray detector, developed collaboratively by NASA and University of Wisconsin scientists, which will be able to measure the mystery line with more precision than currently possible. 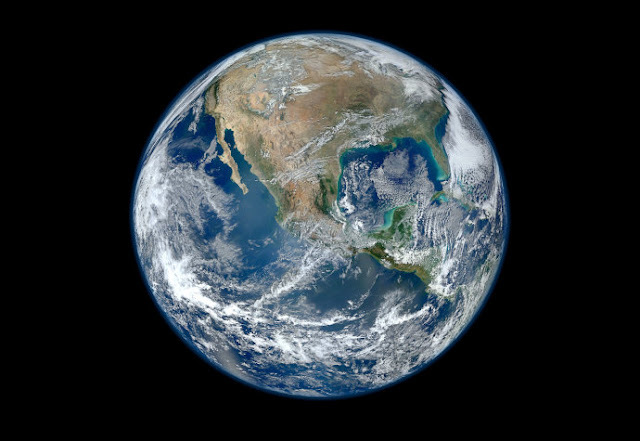 Our knowledge base is based on what we consider to be almost complete knowledge of the Universe, but likely in fact is a very small percentage of what it may be in another 100,000 Earth years. The multiverse theory by Stephen if proven likely will change almost everything. A just reward for a great scientist.